The Southern Comforters is a sub-group of QGSA, its sole purpose is to donate quilts to charity. The group of volunteers meets from 1pm to 4 pm on the fourth Thursday of every month (except school holidays) at Plympton Community Hall, Long Street, Plympton, to sort and cut fabrics, join backing, pin quilts, sew labels, and anything else required. Projects in various stages of completion are taken to Guild meetings when members are given the chance to offer their skills and services to complete the work. Other groups contribute to the work of the group, eg Saintly Stitchers, who share one of their quilting days a month with Southern Comforters. Supplies are mostly donated - unfinished quit tops, fabric squares left over from challenges, and other odd bits and pieces. At present only larger donations for backings are required. Guild allocates, as needed, money to purchase good quality wadding. Over the years the Southern Comforters have made donations to many charities, including Ronald McDonald House, Ruby's Shelter [for troubled or homeless youth], Cyril Lindsay House [a shelter and sobriety group for Aboriginal men], Prison Fellowship, Louise Place [a centre for single mothers] St Josephs' Family Shelter, OARS [Offenders' Aid and Rehabilitation Service] De Paul Society, the Daw Park Hospice, and through St Vincent De Paul Society to African refugees. In addition, the group has, for many years, given quilts to the Adelaide Children's Hospital cancer ward and burns unit, with patiens ranging from babies to 18-year olds. 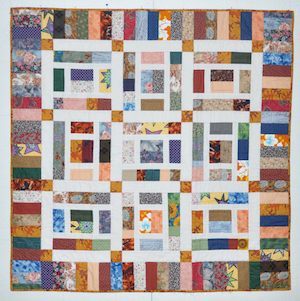 All quilters are welcome to join the group by attending the monthly working bees or by taking a project to complete on a Guild meeting night. There is no time limit or completion date. As there are many groups who now organise their own charity quilt donations, Jenny is seeking out lesser known but worthy receipients. 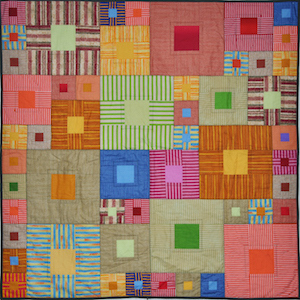 There will still be calls for assistance from time to time particularly to complete the quilting. 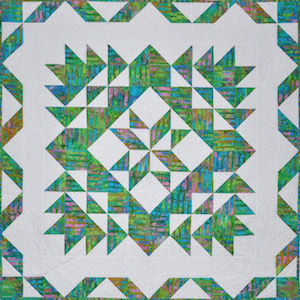 As part of QGSA annual members exhibition, Festival of Quilts, a raffle quilt is produced, donated or purchased. 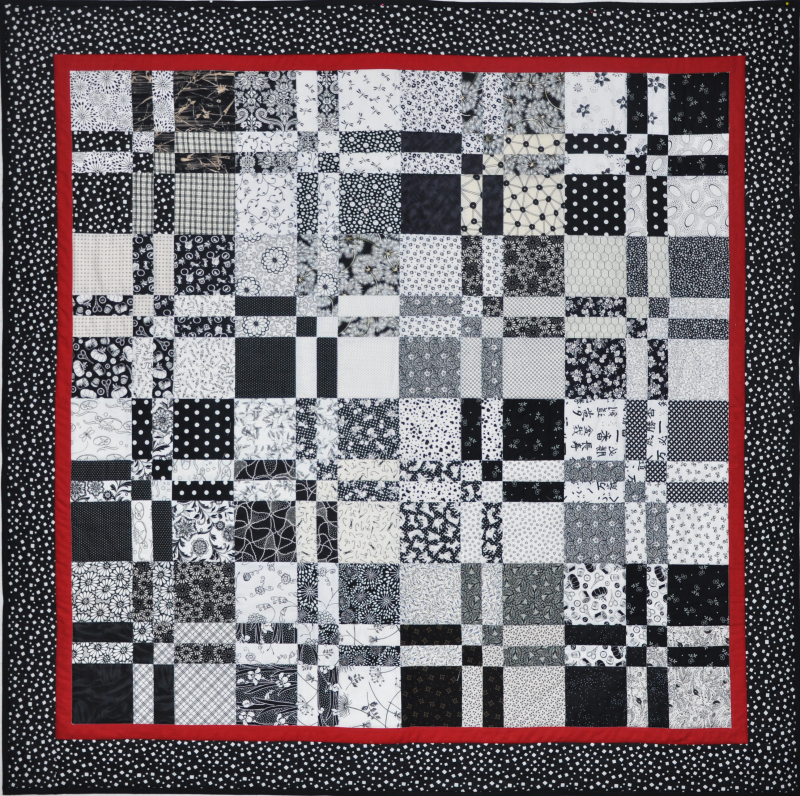 The recipient of the raffle quilt proceeds is selected by the current Exhibition Committee. In the past this has been organisations such as Catherine House, Autism SA, Make a Wish Foundation, Loreto Vietnam, Cancer Council, Canteen, Aids Research, Cranio Facial Foundation and South Coast District Hospital. The previous (not old!) Quilt Encounter Committee intend to continue their Charity work having relinquished duties to the new QE2 committee. Members & friends are invited to support their efforts. "Pick a Bag" Mystery Quilt Kits, a fundraiser for Bedford. Lessa said Mystery 4 was definitely the last but she says now she is getting old and forgetful and beside my garage is still full of fabric! Just for a change the committee have been making quilts for a number of organisations, including Mary Potter, RAH, Lyell McEwen and QEH. 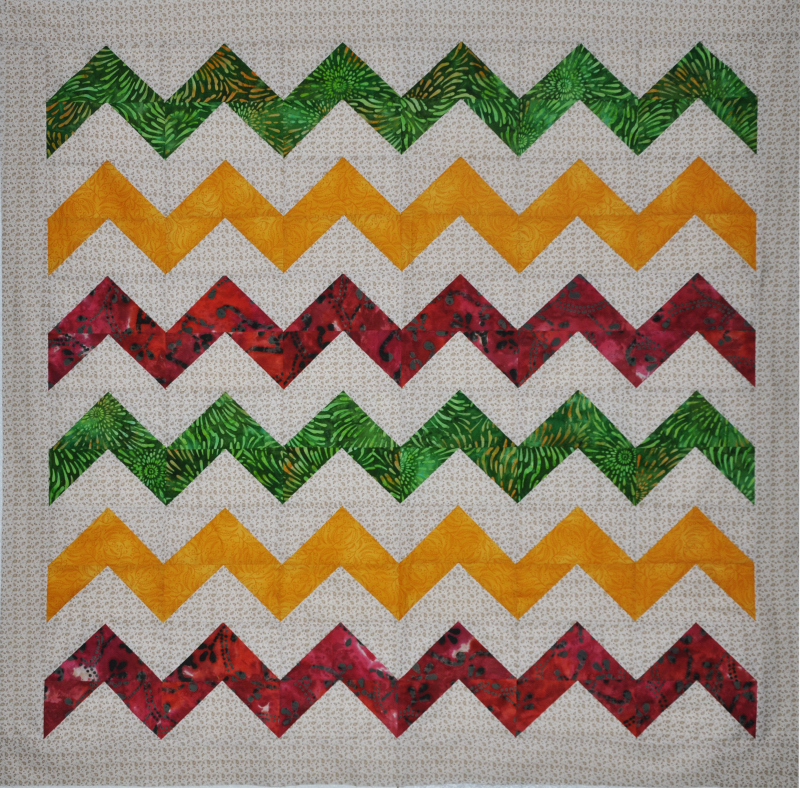 Now they are making kits for these quilts available in a variety of designs and colour ways. The kits are cut and carefully packaged so that the contents are a mystery. 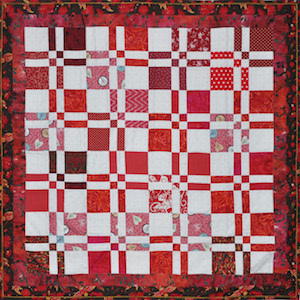 Each kit contains pre-cut fabric, pattern, and instructions for a quilt top 48" square. 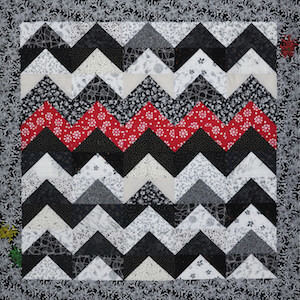 "Pick a Bag' Mystery Quilt kits are $50 plus postage. If your group would like to organise a day to make up your Mystery Quilt Kits, Faye and/or Lessa and the Clayton's girls are happy to come and help any group that purchases 20 or more kits. There is no cost to the group except puurchasing the kits. These sewing days are lots of fun and already a number of Mystery Quilt Bag project days have been held. We are still cutting kits! But to stay fresh we are also making up samples and continually changing the pattern. We enjoy monthly get togethers where we show and tell, and choose and cut fabric for our homework. 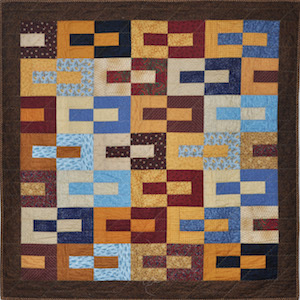 The first of the kits is a Disappearing four patch and is available in a variety of colours. We are also working on Brick Wall' variations and Chevrons. 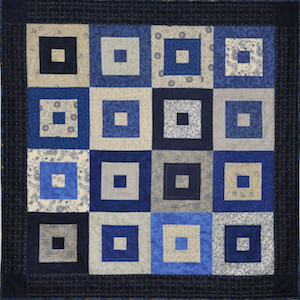 The sample quilts go to various charities and the money raised from the sale of kits goes to the Bedford Group. 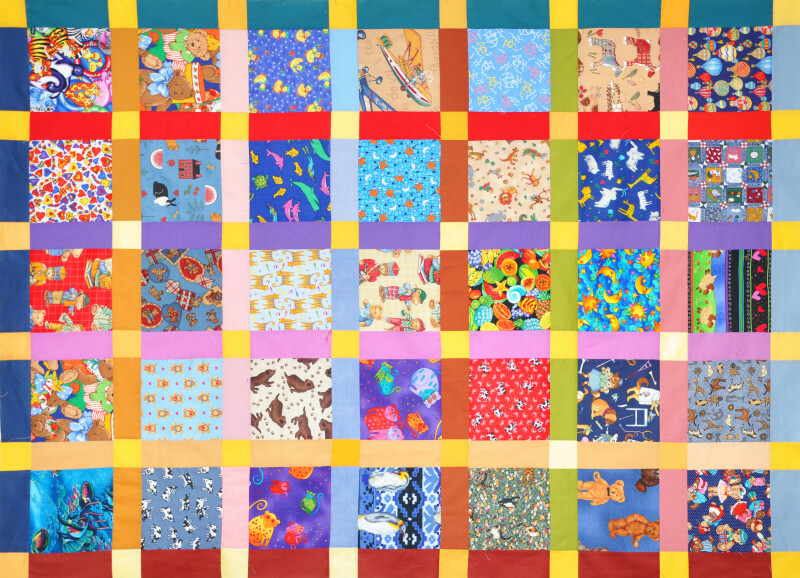 Many of the quilts go to a local hospice and small quilts for children to local hospitals. Some went to Nepal after the recent earthquake. 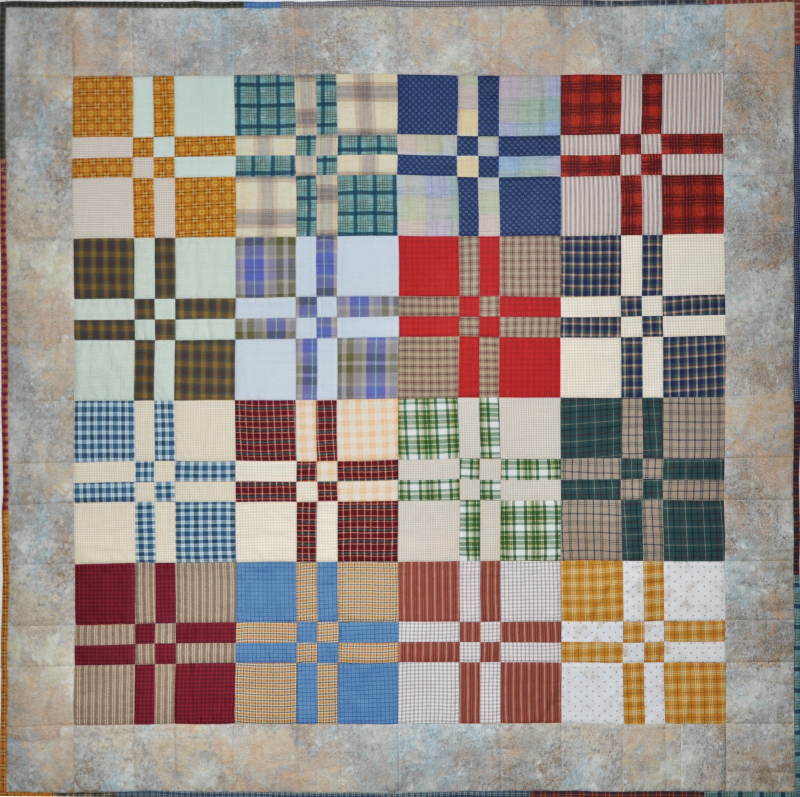 Kits include fabric for a quilt top 48 square and are sold for $40. Eye-spy kits are also available for $25. 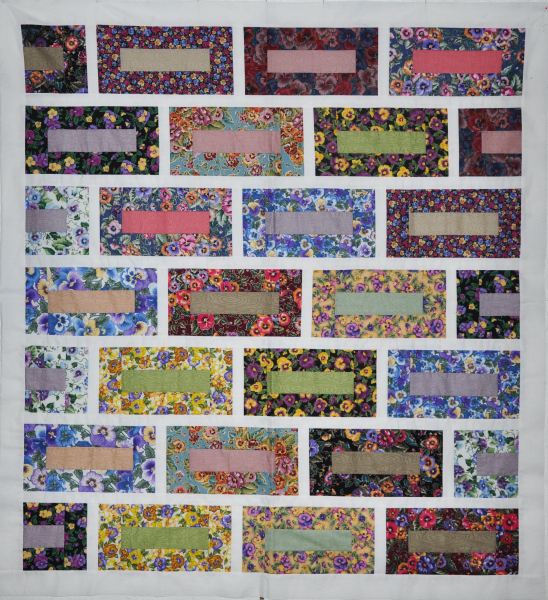 The last in the Claytons Committee series of Mystery Quilts, the 2014 kits and workshops were again well supported. The committee, with wonderful support from quiltmakers and friends across Australia, raised a grand total of $103,443 for the Bedford Group. 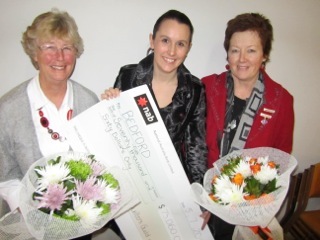 Funds raised will went to Australia's Biggest Quilting Bee raising funds for cancer research. Over 200,000 pieces of fabric (2100 metres) were prepared for the 2012 Bedford Mystery, 20 workshops held. A 'whopping' cheque for $75,060 was presented in July 2012. Ambassador Faye, Lessa for Quilt Encounter and Bedford CEO Sally. In recent years our nation has experienced several major natural disasters that have affected many people. As fellow citizens we want to help, and as quilters we want to make quilts to show we care and to help keep them warm. The Executive has been learning from past experiences and from our interstate colleagues, we have designed some guidelines for the collection of quilts in the future.